East Cornwall Ki Aikido Club has moved to Golberdon Village Hall Cornwall. Golberdon is a village in Cornwall, England situated 6 miles (9.7 km) north-east of Liskeard and a couple of miles from Callington. Relocating to Golberdon we are looking forward to growing our club and welcoming new members. Anyone is welcome to come and visit one of our practise sessions and see what Ki Aikido is all about. Ki Aikido is open to all ages and abilities and our club is open to anyone over 16 years old with no upper limit. The teacher, Simon Andrews studied under Sensei Dave Blayney, a sixth Dan with the Ki Federation of Great Britain and founder of the Callington Ki Aikido Club nearly twenty years ago. 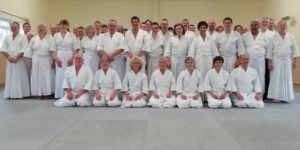 Now a 4th Dan and teacher with the Ki Federation of Great Britain, Simon and the members of East Cornwall Ki Aikido Club, Golberdon, Callington, would welcome anyone who is interested in Ki Aikido or would like to find out more to come along to the club or call for an informal chat. With students from Cornwall and Devon, Tavistock, Saltash and Plymouth, the club offers courses for complete beginners. Close to Plymouth, Launceston, Saltash, Tavistock and Liskeard. Beginners always welcome to come along and have a chat. Beginners courses for all abilities. Men and women of all ages welcome from 16 to 90! The classes are for all levels. Interested parties are welcome to come along and watch the class. Beginners are enrolled throughout the year. Feel free to come and watch a class to see first-hand what it is like and how it is taught. There is a short break in the middle of the class during which we will be happy to answer any questions about what you have seen and about the club in general. If you would like to find out more you are welcome to call Sensei Ian Valentine or get in touch with him by email or message him via our Facebook page.